Does breathtaking have an expiry date? Not in Umrao Jaan’s case, no. 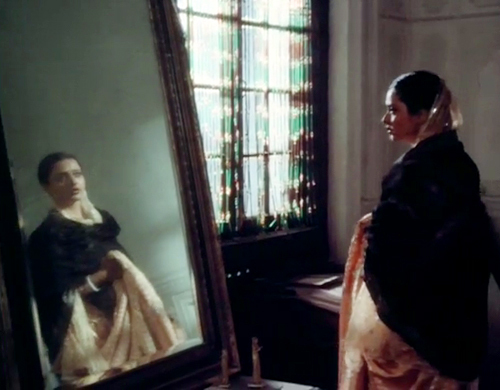 No matter how many times I watch Muzaffar Ali’s tour de force Umrao Jaan, I am overcome with a sense of awe and elation. 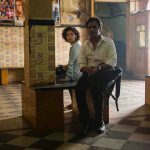 There’s a paralyzing quality to his visuals, resembling living art work, which speaks its own language as exhilarating as the Urdu-laced parlance of its fragile inhabitants. Based on a Urdu novel by Mirza Hadi Ruswa, Ali’s big screen adaptation doesn’t follow the chronology of the original literature but alters and compresses it substantially to compose his personal assessment of it. Instead of a later-day author-poetess conversation narrative, Ali breaks up Umrao’s story into a heartbreaking coming-of-age of an artless teenager to a wide-eyed romantic and gifted poetess to, ultimately, a woman who has recognised the ugliness of the real world outside her equally unpleasant kotha through her relationships with three different men. Umrao Jaan is not a cheerful tale. Her very being is steeped in painful irony, longing and lack of closure. Despite its imminent melancholy, the multifaceted Ali – a fashion designer, a painter, a poet and a bonafide royal (Raja of Kotwara since 1991), merges all his talents to craft a bygone atmosphere that celebrates beauty, poetry, lifestyle, culture, society, romance, music, design and spirit. What lends it soul is an exceptionally majestic Rekha. I had the good fortune of watching Umrao Jaan on big screen, the imagery of Rekha’s glistening tears, glittering jewels and glossy red lips is locked in my memory. But the intricacies underneath her enchanting surface can only be appreciated with enlightenment that comes with time and experience. There’s so much to revel in this fondly made gem by Ali, which begins sometime in mid-19th century and sets most of its premise against the decadent backdrop of indulgent Nawabs and appeasing nautch girls in the imperial city of Lucknow. Abducted from her Faizabad home by the vile Dilawar (Satish Shah in a rare negative role) in a bid to teach her father (Ali in a cameo) a lesson for testifying against him in court, the recently betrothed Amiran, is sold to a Lucknow brothel owner Khanum Jaan (Shaukat Kaifi) while her fleeting companion in misery, another victim of human trafficking Ram Dei, is bought off by a noble household. In one of its most unsettling moments, the seller-buyer parties casually bargain over the price based on the girls’ complexion and features underlining the crude, depraved ways of the trade. Khanum wards off her guilt, ‘Hussaini (her seasoned aid played by Dina Pathak), hum bilkul bekasoor hain,’ arguing had it not been her then someone else would have procured a deal. 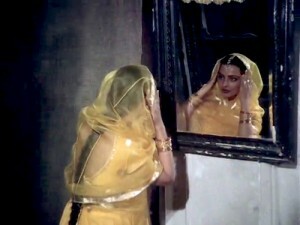 After a struggle of nightmares, attempted escapes, furious beating, Amiran eventually comes to terms with her fate embracing her new life as Umrao Jaan ‘Ada’ (Rekha) — trained in dance, vocals and verse, gorgeously encapsulated against Ustad Ghulam Mustafa Khan’s divine rendition of Pratham dhar dhyaan. Under the keen counsel of the father-figure of Maulvi sahib (Gajanan Jagirdar), Umrao blossoms into a refined individual with an inherent interest for writing verse. He inculcates in her the significance of khayal ki nazakat, alfaaz ki bandish. Despite her evolved demeanour, she is completely attuned to the kitschy surrounding of flippant concubines and her roguish, good-for-nothing childhood mate, Gauhar Mirza (Naseeruddin Shah). Conditioned to charm and obey, Umrao questions very little but is quick to immerse herself in a sea of emotions oblivious to the short-lived allure of her attractive youth, the unreliable patrons of her mujras and the self-seeking double standards of a patriarchal society. Both the naivete of her passions (Kahiye toh aasman ko zameen par utaar laaye. 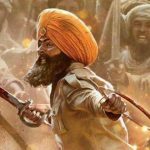 Mushkil nahi hai kuch bhi agar thaan lijiye) and the realisation of harsh reality (Jab bhi milti hai mujhe ajnabi lagti kyun hai? Zindagi roz naye rang badalti kyun hai?) is articulated to perfection in her penetrating ghazals, penned by the inimitable Shahryar. Poetry (lovingly marinaded in impeccable Urdu) in Umrao Jaan is not a mere tool for applause. It’s a poignant mirror into her delicate, devoted and disillusioned heart. It’s what attracts her to Farookh Shaikh’s Nawab Sultan in the first place –Kyun aaj uska zikr mujhe khush na kar saka? Kyun aaj uska naam mera dil dukha gaya? It’s a privilege to understand such resplendent sentiment; it’s a pity to translate it. Umrao and Nawab’s romance swiftly progresses till the difference between their worlds catch up and test the muscle of their attachment. Unfortunately, Nawab doesn’t have the courage to stand against his parents (though divorced) and gives in to his mother’s demands, marries a girl of her choice. In an interview to rediff.com, Shaikh observes, ‘Nawab’s character could not even bargain with his mother to be true to the woman he loves. That was a little alien to my own personality, and I had to prepare for that.’ The understated actor brings out this inadequacy and awkwardness rather commendably. In a cruel twist of fate, the girl he marries happens to be the same Ram Dei (Rita Rani Kaul); Umrao was pitted against in the beginning, leading to Khayyam’s mellifluous composition, Justuju jiski thi usko toh naa paaye humne. One can write paeans in praise of Umrao Jaan’s greatest pillars — Khayyam-Shahryar’s beaming combination and the strength of its timeless melodies – Yeh kya jagah hai doston, Zindagi jab bhi teri bazm, Dil cheez kya hai In aankhon ki masti, etc as well as Asha Bhosle’s (and Talat Aziz’s skilful solo) rousing delivery of the same. Constantly cheated in life, the viewer feels throbbing vulnerability around Umrao, especially when her less deserving peers have it so much better. Yet, despite the series of unfairness and heartbreaks, Umrao emerges as someone who has the will to survive independently. And even provide for. She has a strange soft spot for the silly Gauhar who’s done her more harm than good. Naseer, however, humanises the scoundrel as a compulsively pathetic yet inoffensive sponge. It’s a tall order but the brilliant artist he is, he makes it look deceptively effortless. Raj Babbar’s Faiz Ali is the third guy to walk into Umrao’s turbulent romantic life. Sly and uneasy, it’s not a spontaneous attraction and dictated more out of need than desire. 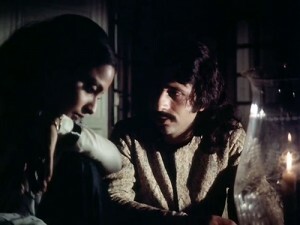 Stifled by her controlled existence and the suffocating kotha, Umrao wants out and adventurous Faiz (Babbar is characteristically nervous but, thankfully, doesn’t get too much screen time) provides the perfect exit. But his true identity is eventually revealed and Umrao is briefly shaken before setting up her own independent business outside Lucknow. In the space of damaged relationships concerned with keeping up appearances, Umrao’s unwavering commitment seems surreal — Tujhko rusva na kiya, khud bhi pasheman na hue. Ishq ki rasm ko iss tarah nibhaya humne, she proclaims in Asha Bhosle’s caramelised texture. If this dreamlike quality contributes in constructing Umrao’s myth and mystery, Ali embellishes the ambiance with opulent authenticity. The tasteful colour palette, the shiny fabric – brocades, muslin, tissue, pashmina, the splendid embroidery, the grand haveli aesthetics (sets made on actual location by Bansi Chandragupta, Mansoor), the dazzling jewelry – maang tikkas, haath phools, jadau haars, studded rings, nose-rings, shimmering bangles, the props and artefacts – guldaan, hookah pipes, paandaans, chandeliers, tapestries, diwaans, chikk (bamboo blinds), sconces, lanterns, framed mirrors, lamps, swords, carriages and a supporting cast of people who hail from the milieu combines to create a striking opulence. She also sought help from actress Jennifer Kapoor (who had recently wrapped up work on her husband’s home production, Junoon) as well as received helpful inputs from Umrao Jaan’s co-writer (along with Ali and Javed Siddiqui), theatre personality, art-director and scholar Shama Zaidi. While the grandeur is undeniable and understandable, what is remarkable is how Pravin Bhatt’s lyrical cinematography never distracts but enhances the mood and lends nuances associated with the period. A grand exterior can only wow momentarily but where Umrao Jaan succeeds is digging deep inside the tradition of discrimination, its impact on an impressionable psyche in the face of incredibly steady unfavourable circumstances. It’s not hard to understand her erratic behaviour or needy temperament in such an unhealthy social climate. The opening credits show a young Amriran (Umme Farwa) in all her bridal fineries even as her mother (Farrukh Jaffer, also recognised as Natha’s Amma in Peepli Live!) lovingly decorates her with precious ornaments while Jagjit Kaur’s husky voice appeals Kahe ko biyahe videsh? Few years later, Amiran, now Umrao, debuts her first mujra offering come-hither looks around a assembly of admirers in a red and gold benarsi, resembling a glowing bride only not quite. The paradox is most pinching. While the politics of gender bias and social prejudices pops it revolting head quite frequently, there’s also a hint of progress through Dina Pathak’s ardent relationship with her lifetime companion (Jagirdar) even though they never entered matrimony. Remember how Mirza plugs Umrao’s appeal to Nawab Sultan –Umrao Jaan ki taareef karna toh suraj ko chiraag dikhana hai. Aisi haseen ke pareestan ki paree zehar kha le. Shaira aisi ke ustaad kaan pakde. Aur awaaz, aah, shola sa lapak jaaye hai, awaaz toh dekho. Umrao Jaan cemented Rekha’s golden aura and classic glamour in history. It also fetched her a prestigious National Award for Best Actress, an achievement she’s surprisingly too modest about. In many interviews, she hints at a low phase in her personal life during its making, which attributed to a persuasive performance. The actress, though not an accomplished dancer, sends the viewer in a trance with her magical recital of kathak and perfectly delivered lines. The electric eagerness in her smile as a woman consumed by her passions is as compelling as the simmering agony of unrequited romance captured in her gleaming eyes. She personifies poetry, which can neither be rewritten nor remade. This entry was posted in Classics, Columns & Reviews and tagged asha bhosle, courtesan, farookh shaikh, khayyam, muzaffar ali, naseeruddin shah, poetry, raj babbar, rekha, shahryar, umrao jaan, urdu. Bookmark the permalink. 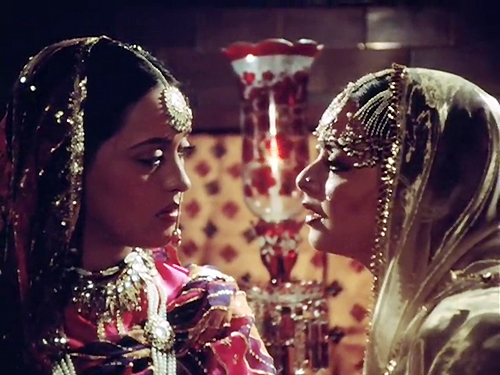 I hv always loved Rekha’s version as opposed to Aish’s version.